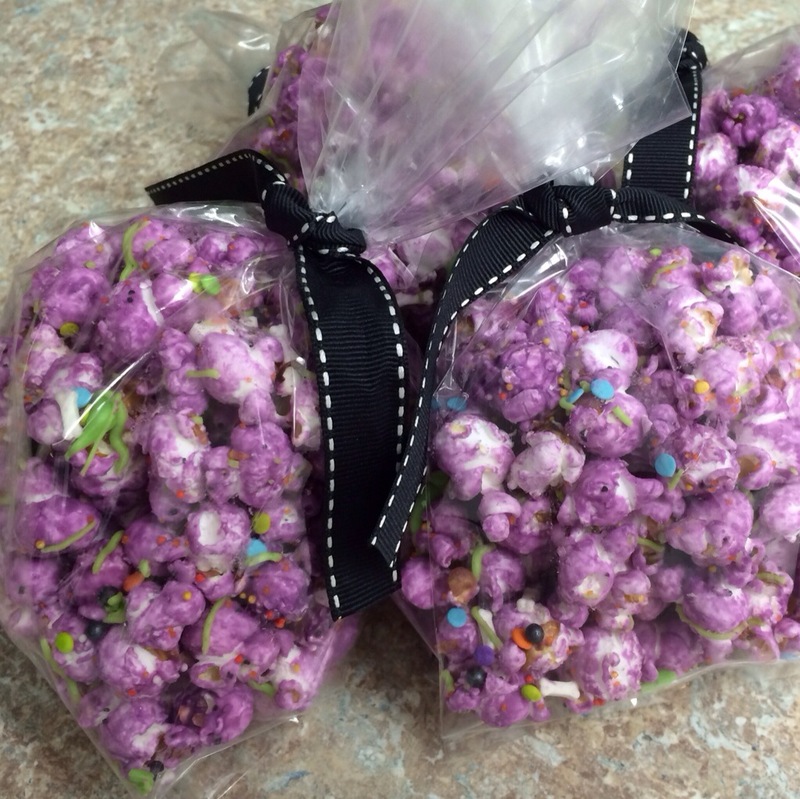 This fun purple popcorn was inspired by this recipe that I came across on Pinterest. 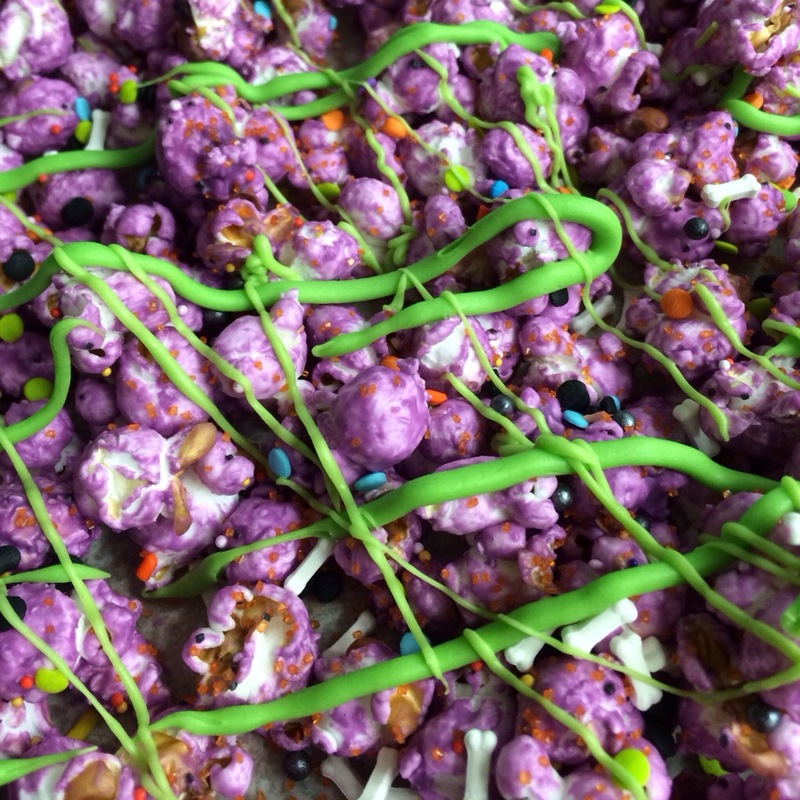 **Just a heads up – regular food coloring will thicken candy melts – do not add food coloring to them unless you’re doing something other than dipping… when you’re mixing it onto popcorn or drizzling it over something, it’s okay if it’s a little thicker. While the candy melts are still wet, add sprinkles. I used Halloween colored quins, an orange/yellow/white non-pareil mix, black dragees, and some white bone shaped sprinkles. 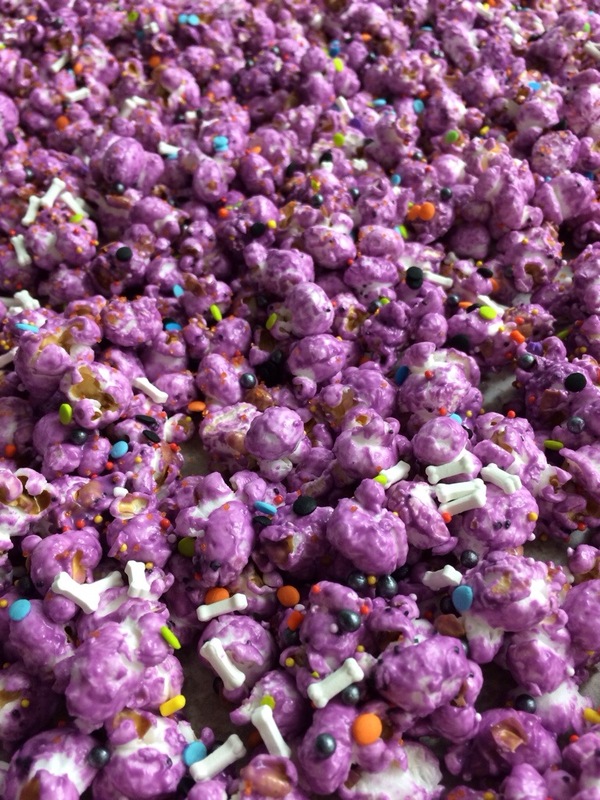 You can also drizzle a second color of candy melts over the popcorn before or after adding sprinkles. I went with neon green. The recipe that inspired these had candy mixed in. I didn’t have enough mini M&M’s leftover, and nothing else to throw in, so I skipped the candy this time. I packaged up some of the popcorn for our neighbor kids for Halloween night. Can’t really give away homemade stuff anymore because it can’t be trusted. But I knew the neighbor kids would at least be able to enjoy it! 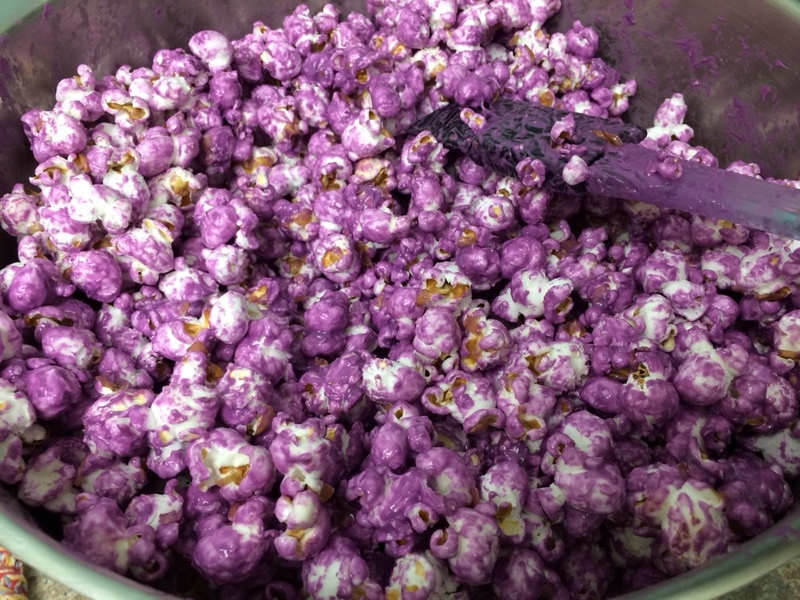 This popcorn is so easy that you still have time to make some by tonight! I would have totally eaten this over a chocolate fountain! I like the salty/sweet combo 🙂 Plus, I ALWAYS get chocolate on me with the fountains… Love the fun colors! What a great idea! 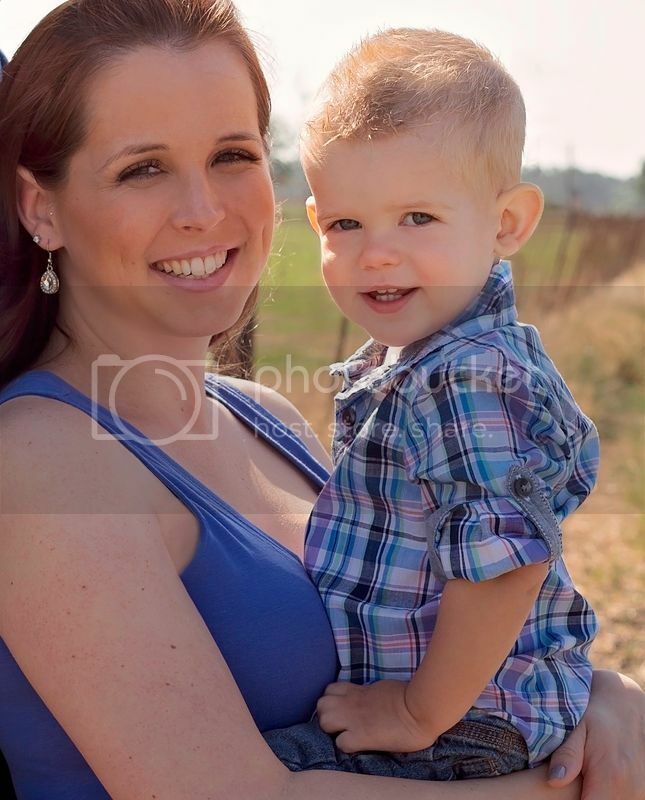 Anything purple is always better!! I love the green you added. The colors work well together. Happy Halloween! !